As usual, there will be a lot of parties going around during festive seasons like Christmas or New Year. And this year, one of the craziest party is back! 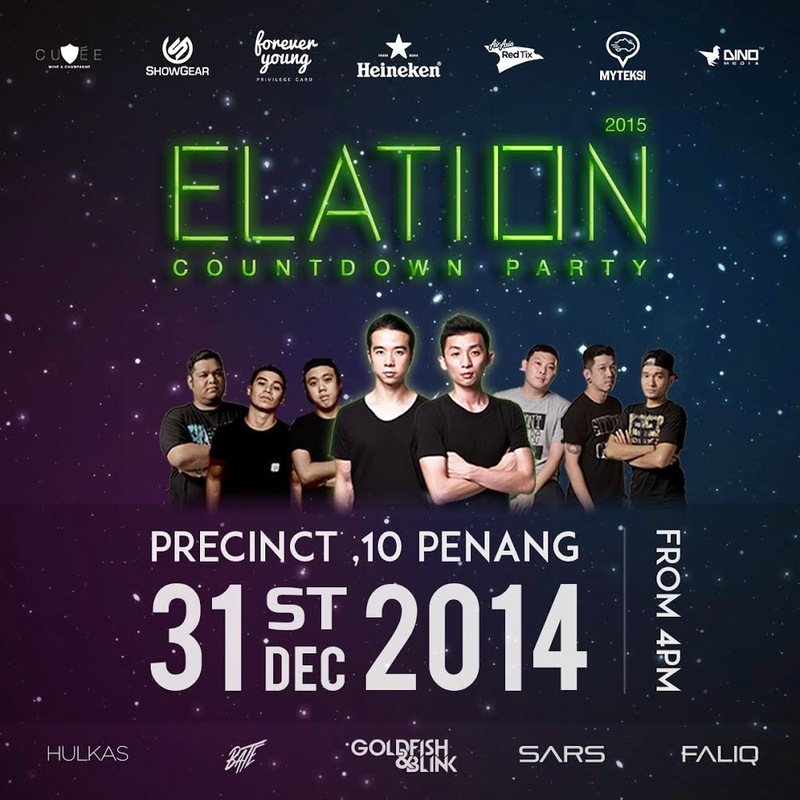 Elation, the New Year countdown party will be held at Precinct 10 Penang, which is going to be one of the best, biggest and the most epic party in Penang! HULKAS, BATE of Zouk Club and darlings of Malaysian EDM numero uno, GOLDFISH & BLINK. Elation is also proud to bring you Heineken! One of the best choice of beverage from 4pm until 1am, and the party will continues at Cuvee, Nuvee and Eat Sleep Drink Repeat! Elation is also collaborate with MyTeksi, one of the best apps to help you avoid traffic jam and let you practice "Do not drink and drive!" This party will be spinning for the whole night to give you a great experience ever! or you may head over to the below destinations. Magnum Cafe has finally came to Malaysia! Though it is not in Penang, but the timing is so perfect that I visited KL last week. So as I heard that Magnum Cafe will not usually stay at one place, they will actually open in a place for only certain time, then they will move to the next place after that. As I heard that Magnum Cafe have been to Vietnam, Thailand, Indonesia and etc, now it has finally opened in Malaysia, which is in Mid Valley Megamall Kuala Lumpur. Christmas is all about celebration and also a good reason for gathering with friends, family or loved ones. In G Cafe, you get to celebrate Christmas with buffet feast that comes with lots of Christmas goodies. G Cafe is also promoting their Christmas and Christmas Eve buffet lunch and dinner. Other than just Christmas buffet, G Cafe also came out with New Year's Eve and New Year's Day buffet too. The signature G in G Hotel, dressed up as snowman this year, what a cute one! The food were all ready when I arrived, G Hotel is well known for their delicious pastries and desserts. Featuring their awards winning pastry chef with those delicious pastries and cakes. International Buffet Dinner & Christmas Goodies @ Sarkies, E&O Hotel Penang. It's been a while since I last dined at E&O Hotel's Sarkies for their buffet. And recently, they have made some changes to their menu again and now featuring International Buffet Dinner daily with more varieties. Sarkies has now removed all the theme buffet, and only featuring International Buffet Dinner daily to offer more varieties of food from Japanese sushi, sashimi, Mongolian BBQ, French dishes, German dishes and etc. At the same time also bringing in some local delicacies like Char Koay Teow, Indian food, Curry Noodle and etc. All the dishes will be run on rotation basis and their customers will get to try different dishes when they visit for several times. Free flow of wine & beverages until 10:30pm. Live music, appearance by Santa Claus, Carolers & party pack. Free flow of wine, beer, and refreshing beverages. International buffet with free flow of wine, beer and refreshing beverages. There are vast variety of appetizers, they have Korean Kimchi, Japanese Baby Octopus, mixed vegetables and many more. Sarkies is also well known for its fresh sashimi, Salmon, Maguro, and Yellow Tail. Cheese corner, which is one of my favourite corner! My favourite cheese would be the blue cheese or garlic cheese! More cold cuts, smoked duck would be my top favourite! The dessert corner is full of those delicious desserts, cakes, pastries and etc. It would be just perfect for sweet tooth! There are cakes like tiramisu, black forest and many more, which is just perfect for dessert lovers. Puffs, one of my favourite dessert too! When we talk about barbecue, it is all about buying ingredients, chopping, marinating and preparing jobs to do. By the time you have done all these preparing jobs, you would be worn out and just lazy to enjoy yourself for the barbecue food. With so many concepts of restaurants coming up, Beep Beep Q Restaurant would be the one that solve your barbecue problems! You can get it from the name of the restaurant itself, Beep Beep Q Restaurant is a BBQ restaurant that serve all sorts of BBQ food, from all types of meat, vegetables and etc. One thing good here is that you don't have to do any grilling or preparing jobs, all you need to do is just sit down and relax, read the menu and order your food, relax again while waiting for your food to arrive at your table, and enjoy your food when it arrives! Beep Beep Q Restaurant is located at Bangkok Lane, where one of the most famous Indian Mee Goreng is located on the same street. It is an ideal place for dinner because it wasn't a busy street at night. The interior here are all done by themselves to save cost, and the decorations are rather specials, you can see that they did put a lot of efforts in this restaurant. All logos of branded cars. There are also outdoor seatings from those who smoke, and the seatings are very well equipped with sufficient fans so that customers won't be sweating while having their meals here. The menu is simple, they offer variety of meats, fruits, and vegetables, basically covered everything you need for a barbeque dinner. For those who come for drinking, you can also order their bucket promotions to get free chicken wings or meatballs, which are quite good. They will serve salad every, and also mash potatoes. The mash potatoes are quite good as they have added herbs and a little bit of salt for flavouring. The "Soup of The Day" on that day was Chicken Pasta Soup, tasted surprisingly good. Gave me a good idea that I can also cook this soup when I am not feeling well, I was hoping to try pumpkin soup too as it was referred by kenhuntfood.com that it was really good. 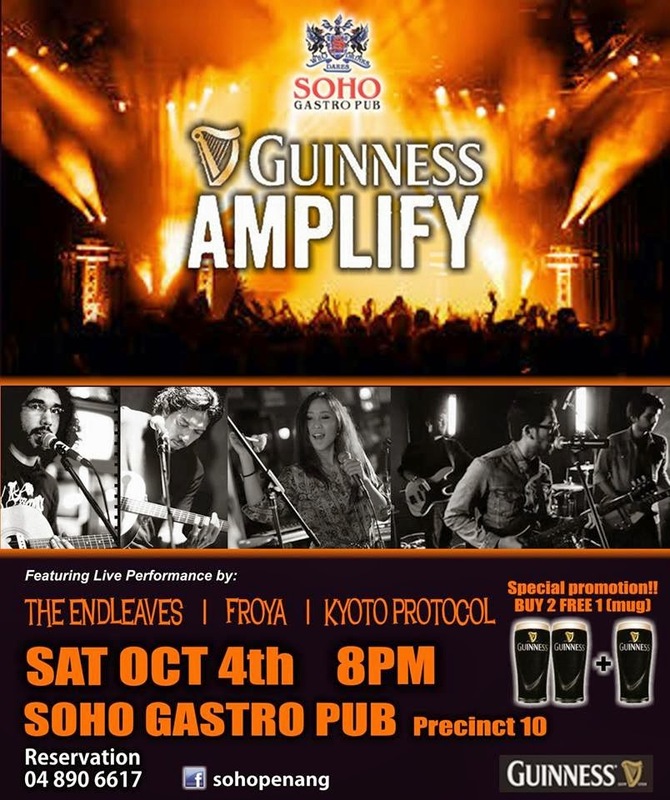 Guinness Amplify : Music Made of More @ Soho Gastro Precinct 10. It's been quite some time I haven't been to any alcohol events. This time I would proud to be invited again by Guinness to their Guinness Amplify : Music Made of More event. They held this event at Soho Gastro Pub at Precinct 10 this time, which is more grand and better too! They have brought 3 bands together this year! Featuring -The Endleaves, Kyoto Protocol and Froya! These 3 bands have brought great music and made the night wonderful! Many thanks to Guinness for the invitation and also Soho Gastro for hosting that night. I was there kinda early, and there weren't any crowd yet, which is good for me to take pictures around. The whole place turned into a total different place than the usual Soho Gastro that I knew. Totally chic and classy! As usual, there's a registration booth to get yourself registered and get some goodies before you enter the pub. Of course there's no entrance for those who are under 18, and Muslims are discouraged from consuming alcohol. There are T&C of the event too. Pretty model at the photobooth session! The entrance pass this year is totally different! They give out bracelets instead of stickers or wristband like last time! Whenever I ask people about where is the best chinese food in Penang, they will always tell "Chin's"
And it is always on the first on their recommendation. Birthday is always the best thing of the year, especially when you get to celebrate it with your besties. And this year I've been invited by Sam and my bestie Minny to dine at Chin's Stylish Chinese Cuisine. Since I've always heard that Chin's Cuisine is the best Chinese Restaurant in Penang, but now I've finally got a chance to give it a try. Chin's Stylish Chinese Cuisine is located at Tanjong City Marina, Weld Quay, which is just next to Clan Jetty, beside QEII, The Water Front Venue. It can be easily spotted if you are standing infront of Penang Clan Jetty. This place is filled with specially designed and imported decorations, furnitures, and also imported artworks to make this restaurant colourful, stylish and chic. This is the kind of view that you can see from here, especially when there are any cruises stop by Swettenham Pier Cruise Terminal. QEII is located next to it, if you are looking for nice pastas, pizzas or any other western cuinese, you can dine at QEII instead. "Malaysia's Best Chinese Cuisine Restaurant 2010 - 2012"
Even these plates are specially designed and imported from China, so colourful and beautiful, bet it should be very expensive too. All these artworks are specially made and imported to add into Chin's. My dinner date, Minny Chan, she's now hotter than before! This is what they serve for snacks, replaced what other chinese restaurants usually did, which only serve peanuts. The first one is something like deep fried noodle and seasoned with salt pepper, very crispy and nice to bite. The one at the back is actually cucumber skin with beans, which at first I thought was some vegetables, never thought that cucumber skin can be used as an appetizer. This prawn cake is so chewy and it basically covered in sesame to make it nicer also added a bit of crunchiness into this dish. Not a bad beginning for appetizer and also remember to dip it together with the chilli provided, it is sweet and spicy thai style sauce to go with this prawn cake. This is one of the favourite among all the dishes of the night. The perfect combination of all these ingredients plus cooking it in the chef's specialties soup has made this dish a BOMB! I've fallen in love with from my first bite, and not forget to soup too, which is the essence from all the ingredients! Golden mushrooms fried together with onions, chilies and other vegetables. Luckily it is not oily like what some other restaurants do. It is very crispy and made it perfect for quick snacks before meal, the portion is rather generous for 4, which is kinda filling for 3 of us for all the dishes we had. This is one of the best mouthwatering appetizer I've ever tasted before. The combination of dried chilis and garlic has also made the cucumber tasted better so the smell would be decreased, the cucumbers are rather crispy and taste good, definitely get you ready for your meal. If you are looking for something to wake your taste bud, maybe you can try this dish instead. But seaweed is also good for our health. This is a chilled appetizer that could be just good for me because my body was quite heaty due to the weather. I'm someone who doesn't like Century Egg, but Minny told me the same, as she would never take century egg but she just love the one here. And so I just put it into my mouth, and rather surprised by how the chef made it became so delicious. The slight dip of chef made sauce and topped with the red pepper is just perfect! This soup came with flames! You can still see the fire at the bottom of the bowl, keeping the soup warm to match with chinese style. This soup is a bit of sour and hot, which is rather appetizing. They have added pickles into this dish to bring out the sourness and also pepper for spiciness. The Cod Fish is just fresh and nicely cooked in this soup, rather smooth and soft when you put it into your mouth and crush it with your tongue. This is definitely another "Bomb" of the night! As I was told that this is one of the signature dish at Chin's, they said I better don't tell anyone I have visited Chin's before if I didn't have this dish here. We had quarter duck, there are also chopped green chillies, spring onions, cucumbers, and also Chin's signature duck sauce. Most importantly, the very thin layer of chef made crepe. First, they will shred the duck meat into small pieces so that you can wrap it with the crepes later. It is my honour that Sam did this by himself. He's such a friendly and nice guy, a great and helpful friend too! You guys can contact him for any booking or special events. 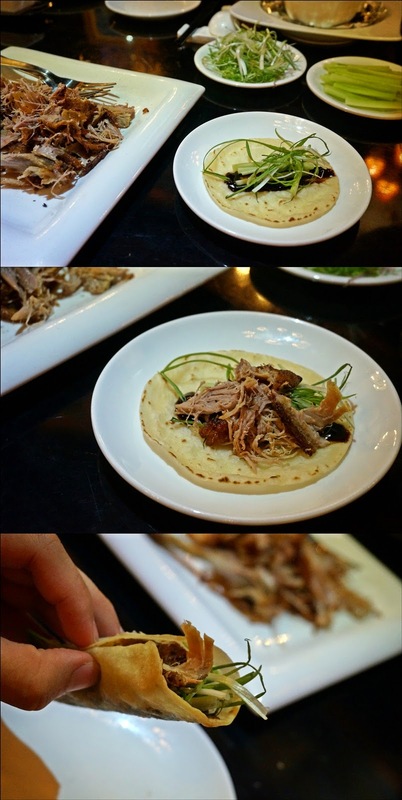 Steps to make a complete "Chin's Aromatic Crispy Duck"
Get a piece of crepe and leave it on the plate given. Apply a generous amount of duck sauce on the crepe, not too much, just half teaspoon will do. Place a little bit of spring onions slices, probably around 8 - 10 slices. Add a bit of chopped green chillies according to your preferences of spiciness. Roll everything together, and SNAP! Take a big bite! Enjoy the mixture of all the ingredients in your mouth and fall in love with it. This fish is come with 2 flavours, spicy and sour. Definitely the red chillies are spicy and another part of it is actually pickles and garlic, which made this dish rather special and at the same time you get to taste both flavours in one dish. The Patin is very fresh that which does not have those fishy smell like what usually freshwater fishes could be. This is also one of the of the must at Chin's, the mutton is soft and tender, and topped with those onions and other spices made it tasted so good. Not to forget the sauce that will go perfectly with rice too! This would be highly recommended if you love the taste of mutton! If you are someone who fancy some hot and spiciness, this is something you should really order. I just love how they fry the dried chillies, peanuts, and the crispy chicken cubes together and made it spicy and appetizing. Must try! Another appetizing dish, though they have added dried chillies into the dish, but it is not spicy at all, just rather sour and appetizing which is just good after having all the heavy main dishes earlier. This dish was surprisingly good even though it looks so simple. The sweetness from white cabbage is just good! The red bean paste is wrapped with pumpkin cake, then deep fried it and covered in sesame seeds. The pumpkin cake layer is rather chewy and sweet, the sweetness comes from the pumpkin itself. What made me surprised was the combination of red bean paste and pumpkin would be so great that both of them tasted so good together. Must try! If you think that this dessert is like some kind of traditional dessert, then you are wrong. I was rather surprised that the chef could make the jasmine jelly tasted like nata de coco jelly, and cooking it together with sea coconut and white fungus still keeping the taste of it. This dessert is not too sweet, it will be good for elderly too. Thanks Minny and Sam for the suprise birthday cake too! It was Tiramisu, my favourite cake! And the cake is nice! Last but not least, take a picture with the so called "Wall of Fame"
It is good to finally have a chance to dine at such a great restaurant. Many thanks to Sam and Minny for the awesome dinner! I will definitely recommend friends to come back here again, not just because it is own by my friends, but also the good food, good services and good reputation of this restaurant would definitely bring me back.